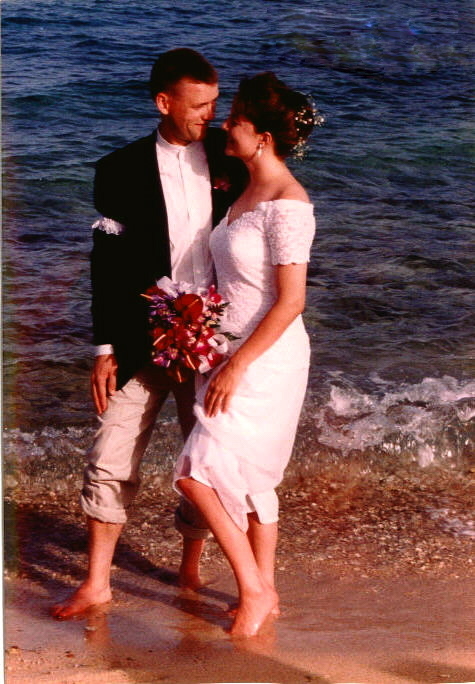 It’s our sixteenth wedding anniversary…wow, where did the time go? As the slogan goes, we’ve come a long way, baby! (And added a few babies along the way). Our wedding certainly wasn’t orthodox in that we traveled to St. Thomas, US Virgin Islands to say “I do.” But it has to be one of the best decisions we’ve ever made. Low stress, high relaxation. And getting to our honeymoon destination from there was a breeze! Today I reminisce on all that was good about that day. Being outdoors on the beach it was truly “God’s great cathedral” as our minister said. Starting the wedding on Caribbean time (in other words, 4:00 means around 4:15). The steel drum music. Anthuriums in my bouquet (now one of my favorite flowers). Strolling down the sandy “aisle” barefoot toward my best friend. I tried to put his wedding band on the right hand instead (in my defense, he GAVE me the wrong hand) and wondered why it wouldn’t fit. We stumbled over the vow “for richer or poorer” replacing poorer with something akin to “pooh-er” (perhaps a Disney freudian slip–or just not wanting to say we would be poor). My dad claiming he had sand in his eye to explain his tears. Telling Clay to “be nice” before he fed me wedding cake. (For the record, he was). And our favorite photo, taken not by the wedding photographer but by a family friend. One of the best days of my life in postcard memories that I pray will last a lifetime. Previous Double Digits Birthday! Next Happy 4th, Y’all!